Reasons to be afraid, or fooled? I guess that I shouldn’t indulge myself in any self congratulatory manner, but when a journalist draws the same conclusions as me, however obvious those conclusions are, I have to own up to being human and feeling somewhat smug. Writing for The Herald Scotland today in an article with the title‘ A promised land built on cuts?‘, IanMacWhirter says: “In the 1950s, governments, even Conservative ones, were not yet in thrall to the free-market dogma that the state has no positive role in the economy. It was taken for granted that, whatever happened, the country should not be allowed to slip back into the under-employed, deflationary condition of the pre-war years, known as the Great Depression”. What IanMacWhirter then goes on to say: “The difference today is that – arguably – we are coming to the end of that long post-war consumer boom, which was based on Western technological supremacy combined with cheap energy and raw materials from the developing world”. So indulge me, and I didn’t qualify the statement with ‘arguably‘, when I said as much in The Debt we’re in that I posted recently. The reason to be afraid is that left wing politicians and economists point to the 1950s as a rationale for high national indebtednesss. For EdMilibandd to join in this homage to debt, perhaps on the advice of his Chancellor, is cause for greater fear. As IanMacWhirter points out: “It’s a curious decade for a Labour leader to cite since the Tories were in power for almost all of it. Most people think of the 1950s, if they think of them at all, as an era of austerity, penny-pinching and shortages. 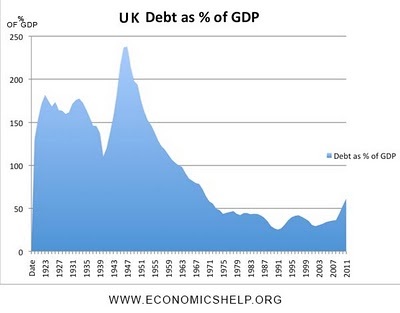 British debt was even higher than it is today, at 145% of GDP”. Of course being in debt is not in itself a problem. The problem is, the ability to service the debt. The debt burden of the 1950s was rapidly reduced by equally rapid economic growth. But for those who can’t count, and I include most politicians and (a lot of) economists in this, the 1950s were 50 years ago. In contemporary terms, pretty much three generations ago. Three generations, who for the most part, do not measure austerity in the same terms as those of us who remember the 50s as something other than history. IanMacWhirter again: “I’m not myself a great fan of the 1950s, which was in many ways a narrow-minded decade marred by class division and stuffy moralising, but I am glad that politicians are taking the post-war era seriously. It makes a lot more sense than the vapid waffle of the Big Society. Indeed, I’m surprised that David Cameron didn’t get there before Ed Milibandd, because the 1950s were a Tory success story”. The newspeak of politicians is to talk only in terms of meeting the budget deficit. In one sense they are right, if the exchequer can raise sufficient income through taxation and the issue of bonds to meet this deficit they could, in theory, ignore the national debt. For those with high debt loads, inflation can be their friend and for a government, to quote Milton Friedman; ‘Inflation is the one form of taxation that can be imposed without legislation’. Don’t be fooled by politicians and economists into thinking that this problem and its solution is beyond our comprehension. Many of us spend our lives servicing what was initially seen as an unbelievable debt load. This is of course, a mortgage. A good many of us are now living the same crisis as our government, in that we are required to service the debt on an asset, purchased at a time of high economic growth, the value of which is now being set in a time of declining economic growth, and we are only too painfully aware of what that means. In this, many of us are now facing our own budget deficit. Unlike the government we can’t raise taxes or sell bonds (unless like them, but what for us would be ‘illegal’, we also create some grand Ponzi scheme).